Small upright tree. Dark green pinnate leaves with about 10 pairs of toothed leaflets, turn red and purple in autumn. White flowers in spring and pale creamy yellow berries. Best in moderately fertile, moist, well drained soil, preferably neutral to acid, but quite tolerant of most reasonable conditions. Moderately drought tolerant. Sun or light dappled shade. 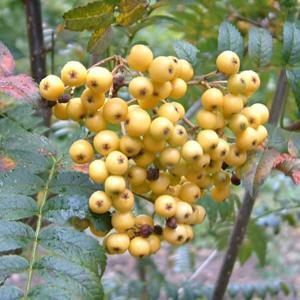 Seedling of Sorbus 'Joseph Rock', raised at Hillier's Nursery in 1968.